[ 44974.354] (EE) intel(0): Failed to submit rendering commands (No such file or directory), disabling acceleration. with no other errors logged. The effects are immediately noticeable in any gpu-powered application: glxgears, for example, stops spinning properly (it appears to shake between the same two frames and only spins while resizing), and video is blank for players vlc and mpv. I've had this happen for at least the past three boots, with cause seemingly unknown (I've tested moderate memory pressure, suspend + lid open/close, concurrent GPU-using programs, and hibernation). The issue appears to have been present at least intermittently for weeks, way back when I was testing drm-tip with the 4.13.1 kernel. particularly when the system is resumed. Nothing happens during the time that the Xorg error occurred. It is difficult to capture the bug with drm debugging due to its randomness and the huge amount of disk space the logs would consume, though I will try and gather some data on it. > drm-tip with the 4.13.1 kernel. If you can identify that v4.12 or v4.13.0 is ok (a day or so of uptime), that would be a big help (in tying it to a kernel update). Similarly checking current (v4.15) drm-tip would also be valuable information. ENOENT means the handle lookup failed, either in the initial object lookup or the relocation lookup. Just a quick "me too", also on Arch. I have to reboot, if this happens. Can't really point my finger on anything yet. No sign of the issue on the 4.13.4 kernel. There is no released 4.14 or 4.15 kernel right now, so I'm not quite sure what you meant by your last suggestion. I was using the latest drm-tip kernel at the time. I will check to see if the issue emerges in the 4.14-rc3 kernel *without* the latest drm-tip changes to try and identify the responsible party further. > No sign of the issue on the 4.13.4 kernel. > kernel at the time. That was me misreading (the "way back when I was testing drm-tip" stuck in my head). > the latest drm-tip changes to try and identify the responsible party further. though quite unexpected. If you have the patient, compiling xf86-video-intel with --enable-debug=full should result in the erroroneous submit being dumped. It's a bit hard to capture the error if it crashes beforehand! Wait a sec. That's not the error path, that's the success path. The kernel returned a pitch less than we requested. On no. and move on to the next error. I need to work out exactly what's going on here, and we still haven't even hit the original bug. The glxgears program I had running also shows yet another bug. Shortly before the bug occured, the window suddenly stops rendering (it logs no FPS). After restarting glxgears the window is still black and the FPS runs as if it were not synced (several hundred FPS). This bug also has just happened again shortly after Xorg is restarted; by chance I caught it stop, and it only goes black once the window becomes obscured. Better version, with bugfix (hopefully). Third attempt, hopefully on the right track now (present/vblank). Fourth is always better than the third. The last two attachments are the same. Are you sure you uploaded the right one? It seems I cannot replicate this bug anymore. Whatever the cause was seems to have disappeared a few weeks ago. > to have disappeared a few weeks ago. Is this without Chris patch? Thank you. I built the xf86-video-intel driver with the full debug option and with the patches applied. I used it for both the linux-git kernel and the drm-tip linux kernel (the kernels which I listed in my last post). Boot up works fine, post-suspend works fine, but after a random period of time, graphics becomes very slow (confirmed by glxgears) and Xorg process starts gobbling up 100%CPU trying to drag a window around while an SDL video is playing. Killing and Restarting X "fixes" the symptoms (for a while). Got the problem, yet again, after smooth sailing with the 4.13 kernel series. First time the bug has occured since I upgraded to the 4.14 series a few days ago. Might be aggrevated by GPU acceleration used for Firefox Quantum. [ 93351.317] (EE) intel(0): Failed to submit rendering commands (No such file or directory), disabling acceleration. Aside from the kernel, these are all the latest Arch packages. So it seems I spoke too soon. Hours later, after just over 4 days of uptime, the twin sister laptop got the bug on the 4.13 kernel. It had been fine since I updated the kernel a few weeks ago, until now. [195685.080] (EE) intel(0): Failed to submit rendering commands (No such file or directory), disabling acceleration. Backtrace and journal logs incoming. 0x432f7 is in kgem_create_2d (kgem.c:5809). 0x5565f is in sna_pixmap_alloc_gpu (sna_accel.c:1693). 0x6047f is in sna_pixmap_move_to_gpu (sna_accel.c:4334). 0x5e8a1 is in sna_drawable_use_bo (sna_accel.c:3810). 0x8caae is in sna_poly_fill_rect (sna_accel.c:15129). Just tried again with both linux 4.14.5 and linux from current drm-tip. Both crash quickly (on that same assert) once it becomes GPU-heavy. I can replicate it with dwarf fortress from LNP. It crashes within minutes upon playing. I am unable to test for the original bug (which is now noticeably more frequent again) until this problem gets fixed. Crash log for the new assert (which is suspiciously close to the previous one). Finally, finally got the dump! As to how useful it is, I don't know, since it seems closely tied to the bo->exec == NULL assert failure I had got earlier. But it was requested, so here it is. I also have the whole 1G log, if you really want to see it or want more context for the error. Bonus crash after VT switch after the failure had occurred. Replicated bug on latest drm-tip kernel, 4.15.0-rc3-15+rc3+960+g91d06d0bbd1a+723723 . Again, I have a 500M log that is available on request. The bug is significantly older than anticipated. For note, my method of testing is opening previously said dwarf fortress game (other games not tested) and both casually and aggressively switch workspaces to and from the game window using marco, my window manager. It's guaranteed to trip the bug in under 10 minutes (usually no more than 5). I have bisected (!) the commit responsible for the bug, using the drm-tip kernel tree. applies the lazy-tiling we employed on gen2/3 to gen4+. 4996368-[   481.838] (WW) intel(0): assertion failed: `bo->exec == NULL'; ignoring and trudging onward. explains the ENOENT. We are calling gem_close() on a handle that is still in the pending batchbuffer. Still scratching my head over the kernel rejecting the surface though, the principle is that the kernel fills in with scratch pages if the fence region didn't fit. should end the ENOENT fail. The underlying problem that the kernel is rejecting tiling changes that (presumably) used to work remains. [  468.733037] arch_pc kernel: [drm] GPU hangs can indicate a bug anywhere in the entire gfx stack, including userspace. [  468.733040] arch_pc kernel: [drm] drm/i915 developers can then reassign to the right component if it's not a kernel issue. [  468.733041] arch_pc kernel: [drm] The gpu crash dump is required to analyze gpu hangs, so please always attach it. Is this bug related to https://bugs.freedesktop.org/show_bug.cgi?id=103509 ? Because it looks 100% like it. The git version of the driver (xf86-video-intel) has the "disabling acceleration" fix, which honestly is the most annoying issue. I don't know how to install a git version on Ubuntu, as I never got used to their package system. Perhaps install a PPA? The relevant intel driver package should be xserver-xorg-video-intel, unless you use the modesetting driver. Downgrading to the linux LTS kernel would probably work, assuming the bug that indirectly caused the accel loss is also responsible for the hangs. Be warned that the LTS kernel might not have all the features needed for an updated system, particularly if you use an up-to-date version of systemd. I wouldn't use the 4.10 kernel because it doesn't receive any further patches and could be a risk to your security or data. If you or anyone else can produce a reliable test procedure that trips the bugs (pitch/tiling or the GPU hang), that would be helpful. Example of one of the types of corruption visible on rare occasion. 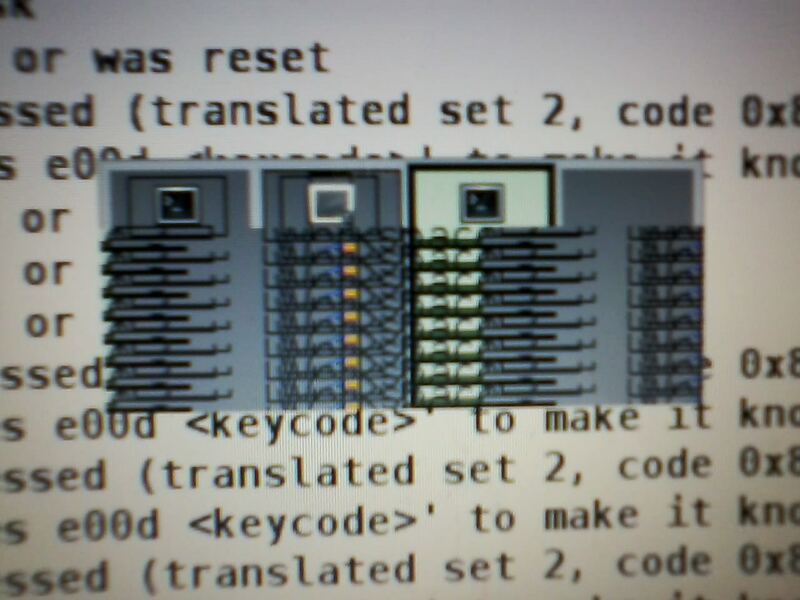 Seems to occur after hitting one of the asserts (as visible behind the corrupted window). These images persisted and did not quickly disappear after taking the picture. They only disappeared if the source image was redrawn. Bugzilla doesn't seem to be accepting uploads due to some bug. So, have some hosted links instead. The latest drm-tip kernel still presents the underlying bug. I built a debug version of the xf86-video-driver to test for the bug again. not be the same problem. Fedora 20 where everything worked fine. (EE) intel(0): Failed to submit rendering commands (Invalid argument), disabling acceleration. Should I try Adric's suggestiong of building the git version of the intel driver? Commit af6d8e9e8f546e5cba60e3a62765c2dbd0328e83 contains the fix to the accel loss issue. Your intel driver appears to be dated 2017-10-25, while the fix was committed on Dec 16. If it's the same issue, building the latest git version of the driver will fix it. "Your intel driver appears to be dated 2017-10-25, while the fix was committed on Dec 16"
Thanks, but I see now that the problem that was fixed is only that signaled by the specific message "File not found" whereas I had sometimes that message and sometimes "Invalid argument". So I assume that there are other problems as well and that it could be any number of things that would result in the acceleration being disabled (although merely disabling acceleration should not cause such an egregious slowdown, so I guess there is something else that happens at the same time as well). I guess I just have to go and buy some other video card? I will try to try the git version but I doubt I can get it built correctly. I wouldn't be too sure that you have a different bug. Looking back at my testing data, the nonexistent file error was most common, but I also recorded at least two instances of the invalid args error which followed the same sequence of executed code as the others. Looking at the drm-gem manpage, it states: "Invalid object handles return EINVAL and invalid object names return ENOENT [file not found]." Which error is returned, I presume, is dependent on how the kernel/drm system reuses that memory. I don't have Fedora to try and create a package on, but I can attach the installed files and you could copy/install the intel_drv.so file yourself, bypassing the package manager. Make a backup of the file(s) first. Use at your own risk. It should work, though. Thanks a lot Adric, I will be trying that. Right away last night I downloaded the git version, which seemed to build okay, and I did a make install. It put the drivers in /usr/local and changed the ldconfig, and I restarted the display manager which came up but when I logged in a got just a blank screen. I was a little spooked and just did a make uninstall and went back to the old. But I will try it again and try also your version. Your quote from the manpage does suggest it still is possible it is the same error. I wonder why there are so few reports. Also why Fedora has a driver from so long still in its repo. I might wait a while to try this until the problem happens again since it appears I did not after all test the older UXA mode after all (stupidly added SNA and UXA lines but then commented out the wrong one) and would like to see if the UXA works. But will report back asap. Remember that you can view the Xorg.0.log/Xorg.0.log.old files and the system log if something blackscreens. Thanks Adric, I am going to try various things eventually but the first thing now I want to do is use the old UXA method to see if it runs okay for a long time without the loss of acceleration. Then I will try various versions of the driver with SNA and I will report back. I also just discovered when googling around a great deal that many recommend not to use the intel driver at all anymore. And in fact when I checked the drivers on a new computer I just installed fc27 on, I see it is not using this driver although it is installed (using the onboard graphics with an i3-8100)! Wow, I had no idea about this. It is using the generic "modesetting" driver (seems to be a misleading name) and that seems to work just fine, even with things like google earth and the like. I guess most of the important hardware specific stuff lies really in the kernel side of the drivers, at least for the newer hardware. I should try this also on the older (onboard graphics with i3-540) hardware. I bet it won't work but first I want to run the UXA longer to see if gets the "acceleration dropped" problem. Prima facie it seems like use SNA with the intel driver would be the most desirable configuration however. UXA and modesetting are noticeably slower, though. For my older hardware, it's preferable to have SNA. They are slower and also perhaps the generic DDX driver doesn't work with older hardware at all. That turns out to be why I got the blank screen earlier. Anyway I have now run a recent git version of the intel driver for quite a while in SNA mode without a recurrence of the big slowdown after acceleration being disabled. I will assume it is probably going to be okay, and am now turning attention to another machine, a much newer one. I have found the intel driver is not usable on this right now because of some strange issues with webcams. It cannot display webcam output on the screen. The generic DDX "modesetting" driver works just fine in this and other regards (although like all drivers, it simply cannot do smooth scrolling but that's apparently how linux is...). I will make a detailed new bug report on this issue after I have done some more looking into it when I get the time. "Anyway I have now run a recent git version of the intel driver for quite a while in SNA mode without a recurrence of the big slowdown"
Having now run a recent version for about 3 weeks without stopping it, it seems to go okay. Tt has not suffered the slowdown in all that time. "I have found the intel driver is not usable on this right now because of some strange issues with webcams. It cannot display webcam output on the screen." Also, the more recent driver no longer has this problem on the newer hardware (i3-8100). Are you saying this can be resolved / closed? I don't think so. The underlying kernel bug still exists, although the xf86-video-intel driver bug has been fixed. (See comments 45 and 10-11.) Though, if you think that the kernel bug deserves its own bug, rather than a bug report for the sympton I can do that, but I think it should stay with the data here. Yes, sorry, I did not mean to imply the problem had been fully resolved, only that the driver apparently had been altered so the particular symptom of losing acceleration and subsequent slowdown had gone away in my case. I should have made that more clear. I have found yet another test case towards triggering this bug, and this time it's much faster. Using this method allows me to fairly easily trigger GPU hangs and eventually cause loss of acceleration one way or another. Arch Linux x86_64, as always. In this case, I am running a freshly-installed cinnamon (1.8) and using gnome-terminal. To trigger the bug, I open a new virtual terminal window and resize the window in the horizontal direction (up-and-down alone doesn't work). When you rapidly reduce the terminal window size in the horizontal direction, it is very likely that the bug will occur. A larger window seems to help; the contents or zoom level of the window might have an effect as well. Rapidly performing this process for extended periods of time has very interesting effects (see below). About every time the bug is tripped by this method, visual flickering and/or corruption occur with the window, but occasionally other random parts of the screen bear corruption as well. 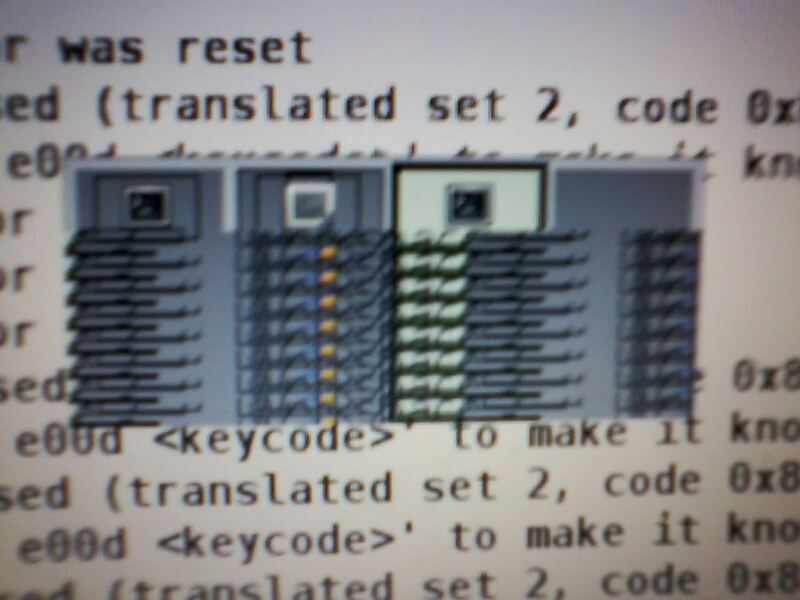 If I manage to stop resizing the window when the corruption occurs, the corruption tends to persist. The windows themselves will contain the corruption; it can be captured by screenshots and the alt-tab previews, as well as be minimized and unminimized without losing the corrupted contents. I have several screenshots of the corruption as it builds. If you patch the xf86-video-intel driver to change would-be asserts into driver warnings (non-debug version), you'll see that the warnings (that are reachable in the non-debug build) are emitted whenever the graphical corruption occurs. When my test method is done repeatedly with varying intensity for extended periods of time, after about several minutes the GPU will hang, sometimes repeatedly. If you're unlucky, the reset can fail (haven't reproduced that on my exact software setup though). Alternatively, the 2D driver can break and lose acceleration almost like in the original bug report, but I haven't yet replicated that either. I have as many GPU error states as I could capture. However, except for a few relative timestamps and maybe one or two other minor things, they all appear *exactly* the same. Does it only capture the first error? [ 10991.936] (EE) intel(0): Failed to submit rendering commands (Input/output error), disabling acceleration. 1 [ 10931.396] (WW) intel(0): assertion failed: `bo->pitch*kgem_aligned_height(kgem, height, bo->tiling) <= kgem_bo_size(bo)'; ignoring and trudging onward. 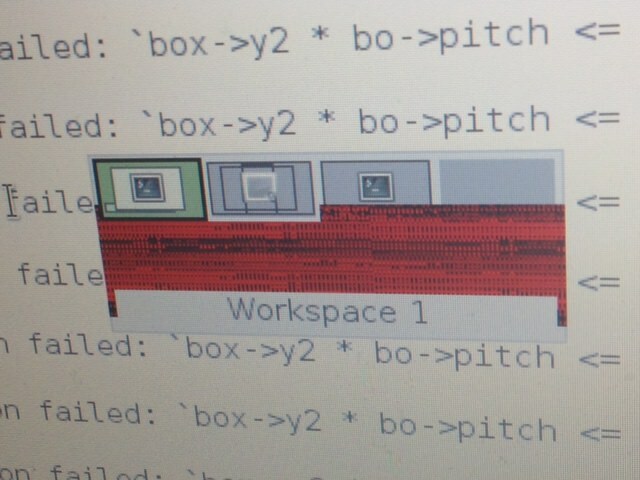 1 [ 10931.397] (WW) intel(0): assertion failed: `box->y2 * bo->pitch <= kgem_bo_size(bo)'; ignoring and trudging onward. 2 [ 10931.398] (WW) intel(0): assertion failed: `box->y2 * bo->pitch <= kgem_bo_size(bo)'; ignoring and trudging onward. 6 [ 10931.399] (WW) intel(0): assertion failed: `box->y2 * bo->pitch <= kgem_bo_size(bo)'; ignoring and trudging onward. 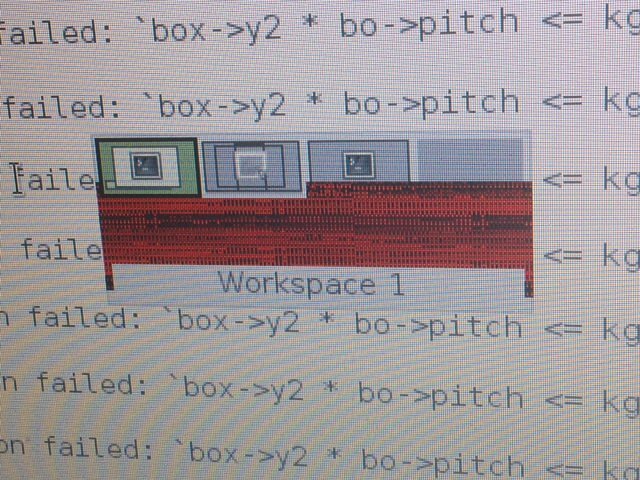 4 [ 10931.400] (WW) intel(0): assertion failed: `box->y2 * bo->pitch <= kgem_bo_size(bo)'; ignoring and trudging onward. 6 [ 10931.401] (WW) intel(0): assertion failed: `box->y2 * bo->pitch <= kgem_bo_size(bo)'; ignoring and trudging onward. 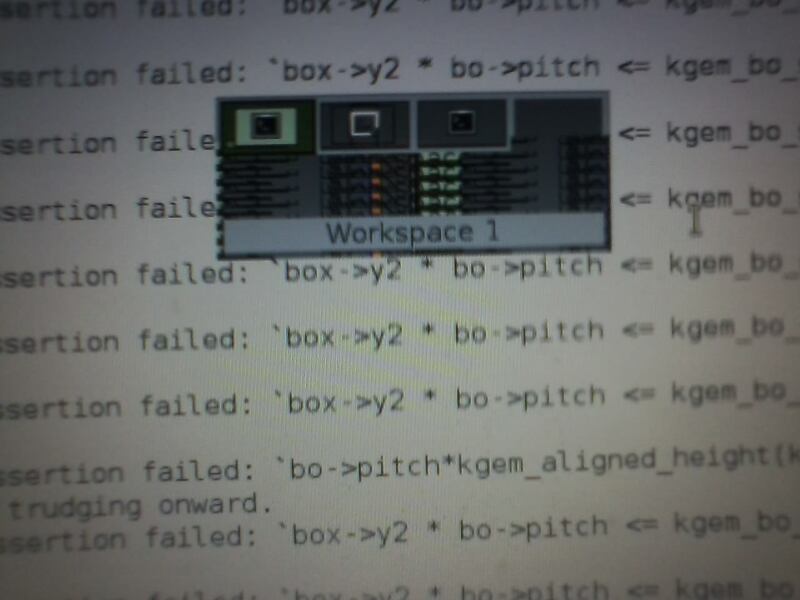 1 [ 10931.402] (WW) intel(0): assertion failed: `box->y2 * bo->pitch <= kgem_bo_size(bo)'; ignoring and trudging onward. 1 [ 10931.439] (WW) intel(0): assertion failed: `bo->pitch*kgem_aligned_height(kgem, height, bo->tiling) <= kgem_bo_size(bo)'; ignoring and trudging onward. 3 [ 10931.440] (WW) intel(0): assertion failed: `box->y2 * bo->pitch <= kgem_bo_size(bo)'; ignoring and trudging onward. 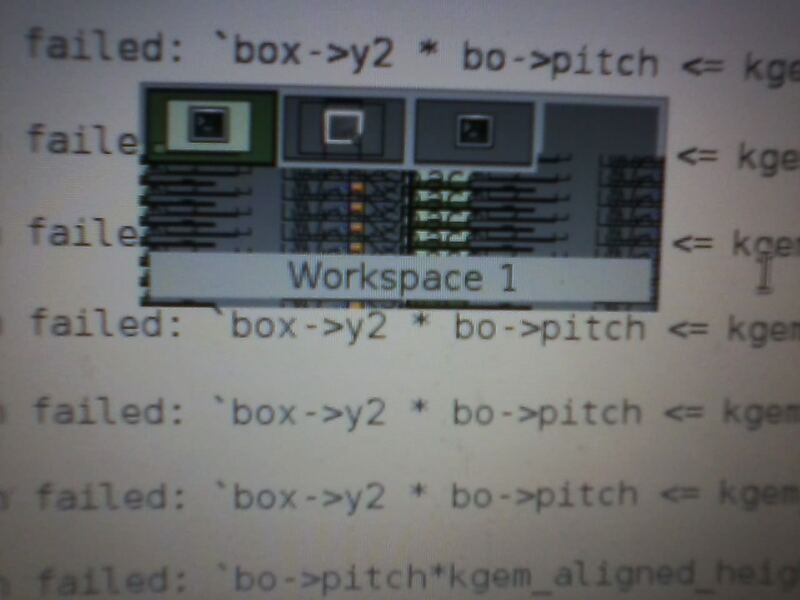 13 [ 10931.441] (WW) intel(0): assertion failed: `box->y2 * bo->pitch <= kgem_bo_size(bo)'; ignoring and trudging onward. 8 [ 10931.442] (WW) intel(0): assertion failed: `box->y2 * bo->pitch <= kgem_bo_size(bo)'; ignoring and trudging onward. 1 [ 10991.936] (EE) intel(0): Failed to submit rendering commands (Input/output error), disabling acceleration. 1 [ 10991.937] (EE) intel(0): When reporting this, please include /sys/class/drm/card0/error and the full dmesg. I might be able to test using a debug driver if need be. I fat-fingered the submit button, but I meant to add that I was running glxgears and intel_gpu_top at the time, in case it's relevant. I'll try to test the drm-tip as soon as I can get my version to boot. Underlying bug still present as of kernel ~4.18rc3. I've experimented with my newest trigger case, and I can determine that the trigger for the bug depends on the window manager in use. So far, I've only been able to replicate the issue with cinnamon and gnome-/mate-terminal, but I haven't thoroughly tested every possibility. I decided to test on a few other different machines that I had around but couldn't test until now. Testing with the cinnamon desktop, I can load the desktop, but the moment the gnome-terminal window opens the window flickers/glitches like it would do on my gm45 and the GPU hangs. No resizing required. I collected three dumps for each boot I tested this. Second dump was an assert-enabled build with a patch to ignore some problematic asserts. Oddly enough, it hung without hitting any of the kgem/pitch asserts that I was expecting, despite the same flicker I saw. Running the cinnamon desktop. Third dump was an assert-enabled build like before, but I started with the mate desktop and attempted to replace it with cinnamon from within. It hung without me opening gnome-terminal, though I already had a terminal window open. Haswell (gen7.5, gt3) - Intel Iris Pro? No msg in kernel log so I'm not sure. EFI. I tested this system like I would with my gm45 (cinnamon, resizing gnome-terminal as stated before), but I could not observe any flickering using the stock xf86-video-intel driver. I maxed the cpu and spun up as many instances of glxgears as possible, but resizing the window still failed to trigger the bug. Getting back on track, I made a decent attempt at debugging the (underlying) bug that is responsible for these issues. Tested on kernel 4.18rc6+218. I reproduced the bug with full debug logging and drm.debug=0x1f. When the bug would occur, it would hit an assert that I have ignored in the xorg driver. Using the time of the assert, it is easy to line it up with the ioctl result listed in the kernel logs. I determined the execution of the ioctl by setting a logged global to certain values depending of the part of the code that gets run. This is probably not the only kernel code path which causes the bug in the xorg driver. My bug replication method tends to only hit the bug on one path in the xorg driver, while a few other known paths get triggered by other uncertain uses (see the asserts that I ignore). With this attachment you should also be able to see the other ioctl errors that were reported in the bug trace. Presumably, some of these will also be the result of some unhandled error in the kernel module. What is the plan about this bug? Do you guys maintain i915 kernel driver or should it be reported upstream? If the bug was bisected in kernel to specific commit can it be made optional as a workaround if it is impossible to fix? > the result of some unhandled error in the kernel module. Adric, The original issue is related to "Failed to submit rendering commands", in result the system has become slow. In the attached log, I don't see any similar errors. If this issue is different than the original bug I would consider to close this bug and recommend to create a new bug. It would be good to at least update the summary to describe what the remaining "underlying kernel bug" is. I read through the comments but it wasn't very clear to me at least. Adric Blake, as some time has passed since the last update, I hope you don't mind me asking: are you still experiencing the issue as originally reported? On an up-to-date GM45 system, the corruption+hang bug still exists; it hasn't changed. This was tested using kernel 5.0rc6. The userspace driver has been patched to prevent itself from closing a handle too soon because of unusual kernel allocation behavior (which caused the original bug), but either a problem in the driver or in the DRM/GEM system causes corruption to form in drawn buffers and possibly in other memory with certain driver operations. I believe this to be caused by the same state which triggered the original bug. > hasn't changed. This was tested using kernel 5.0rc6. Can you please add the error, dmesg and xorg logs from this kernel?